The New York Times came out with a report on opioid drugs, pain drugs, the dangers of drugs and even talking about placebo. So what their study said is that 44 people die every day from prescription painkillers. 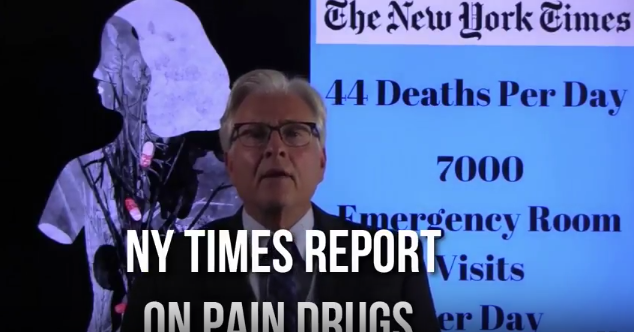 7000 emergency room visits every day from prescription painkillers. Now, they went on to describe how opioids which used to only be prescribed for these extreme cases are being handed out now – they didn’t say like candy, but almost like candy. Oh! You have a little back pain opioids, opioids, opioids. This are dangerous, addictive drugs. Yet they’re handed out willy nilly because there’s nothing that the medical community has been able to find that will help you get better. So the article went on to suggest that perhaps the answer to the opioid problem, and the pain drug problem in general, are placebos. Now most of us know that placebos are when you expect something, they give you a sugar pill, you expect it to work, it works. The problem with the placebo in pain is the results are best temporary. As a matter of fact surgery is typically a placebo. So temporary relief, then the pain comes back because instead of eliminating the actual cause of your pain, they treat a symptom which has temporary results. Without the cause being eradicated the pain comes back. So, okay you can risk surgeries, you can risk these dangerous drugs or you can do something that’s conservative and non-invasive and non- medical, non-pharmaceutical that just got a 100% in a Mayo Clinic Pilot. Take the pain test zeropainnow.com. You’ll know with scientific objective almost cetainty, 97%, whether or not you can get better. And then all you have to do is pick the program that’s best for you and go forward. Got a whole staff waiting to help you. If you have questions send them to me adam@adamheller.com. All we care about, all the whole team cares about, helping you get pain free. Today is your day take a step. We’re all here to help you.